Today I was invited to a poster presentation by Lakehead University and Confederation College (Thunder Bay) Nursing students; Marla Allard, Mirnada Thibeault and Robyn Wideman. Their topic, Suicide Prevention. Driven by professionalism and personal experiences with suicide, their messages were loud and clear; (1) Suicide knows no boundaries (2) We need to talk about suicide NOW. 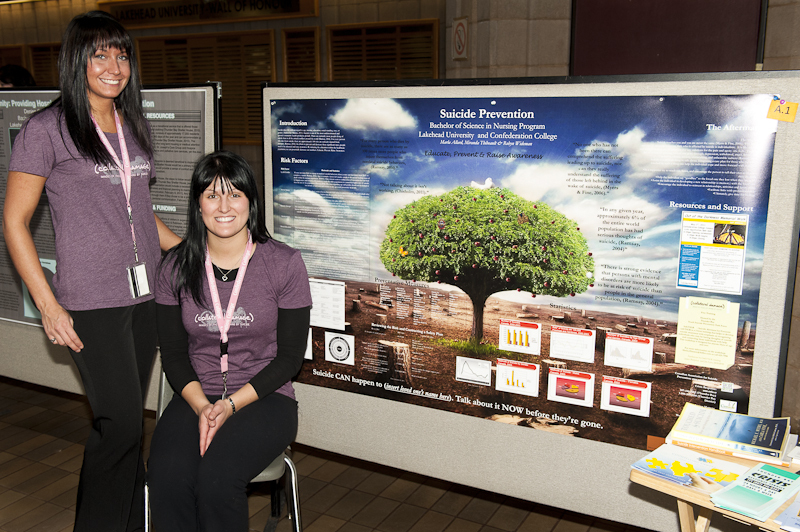 Congratulations for your personal and professional commitments in creating a dialogue on suicide, advocating for suicide prevention training and doing your part to break the stigma that surrounds suicide. Your poster looks beautiful. I wonder if you have any closeups so that it can be read online and shared with others? Keep up the good work. Nurses are on the frontline of defense! Great job ladies. It is wonderful when young professionals have the desire and passion to speak up about suicide and how together we can help to make a difference. awesome! Well done! Beautifully done and easily understood. Wow thank you……:) Penny, Survivors of Suicide loss! !